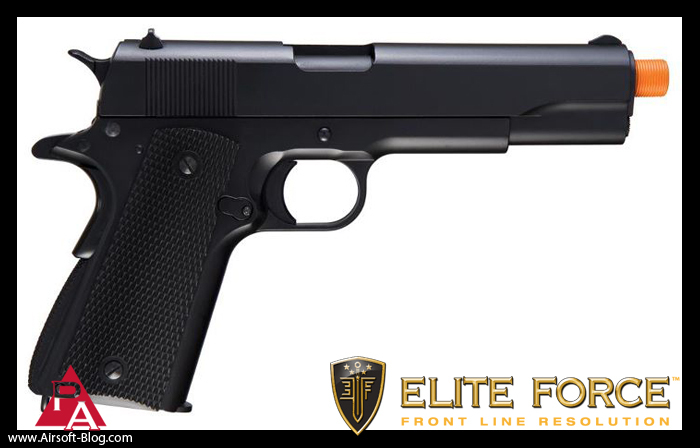 My homies, Cliff & Andy over at Elite Force Airsoft have released a sneak peak at their new M1911 Gas Blowback Pistol. There have been contentions on the Elite Force Facebook page that this is just another WE rebrand. Well, sports fans, while I have yet to confirm anything with Elite Force officially, I did receive some reliable intel a few months back that Elite Force was partnering up with a rather unexpected, but legitimate & well-known manufacturer to handle this project. 14mm Counter Clockwise (CCW) Threaded orange tip (Safe & law-abiding Airsoft gun owners are eligible to be consider Airsoft Champions). 345 FPS (this seems a bit low for CO2, but I could be wrong here). Cliff & Andy do know what they're doing, so I'm giving them the benefit of the doubt. 60-day replacement warranty. God Bless American-based companies. If Elite Force partnered with who I think they partnered with on this gun, then this is going to be one heck of bargain! Unfortunately, I'm not at liberty to speak freely on my assumption until I've confirmed with a credible source. Stay tuned! Subscribe to the new Pyramyd Airsoft Facebook page for more up-to-date intel on all kinds of Airsoft & Tactical stuff. We've also got a Twitter page & YouTube channel, if you're in the mood to do some more subscribing. Check out our latest YouTube video of the Echo1 Modular Tactical Carbine (MTC) featuring Brian Holt of Echo1 USA and yours truly.